← WTF Wednesday: Why Doesn’t Caremark Care? As I’ve shared, we’ve been dealing with kitty dental drama. Helen accidentally lost a tooth, we had the vet pull a bunch of Chrissy’s teeth. It’s not good. At her most recent check-up we learned that Helen is developing a lot of tartar around her teeth. 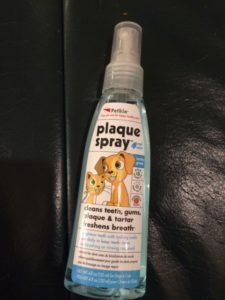 We’re hoping we can avoid having her teeth pulled, so Dan picked up some pet plaque spray. The instructions say to squirt it in the back of the pet’s mouth. Umm, sure, no problem. 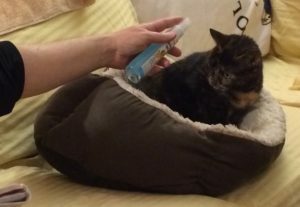 Have you ever tried to spray anything in your cat’s mouth? Is your nickname now Captain Hook? Dan decided to use the spray not only to address Helen’s plaque, but also to try to “train” her. Have you ever tried to train a cat? Is your nickname now Dumbass? Helen has a bad habit of licking Dan’s hair. A lot. As soon as he settles on the couch to relax. So he adopted a stance of spraying her as soon as she started in on licking. Do you think she learned anything? Hell no. She just kept going for it. Recently I wasn’t feeling well and was spending quality time in bed, and Dan was hanging out upstairs, keeping me company. Helen therefore missed out on her normal evening licking time. Sad. But she was not to be denied. She started climbing in bed and licking Dan’s hair as soon as he was in bed or was actually trying to fall asleep. She tried it with me too, woke me up in fact, but I swatted her away. So the next night, I noticed Dan tucking something under his pillow. Turns out, he was packin’. Loaded for bear. Armed for an attack. Yes, he had tucked the bottle of plaque spray under his pillow. He was giddy at the thought of grabbing Helen when she tried to disturb his sleep, and giving her a rude awakening. The man is deranged. Dan isn’t even licensed to carry the damn thing. I was convinced that he was going to accidentally blind the cat, or himself, or otherwise injure one of the three of us. Or what if one of the other cats got caught in friendly fire? Then what? No, I didn’t like the idea one bit. Dan swore up and down that it would be fine, and accused me of being dramatic. Ha! Me? Dramatic? I think not. Anyway, thus far we have not had any midnight incidents. At the same time, Helen resolutely refuses to associate her behavior with a negative consequence. So B.F. Skinner’s theory of operant conditioning worked on intelligent mice, but…well, let’s just say he never met Helen. Umm, do you want to lose that hand? This entry was posted in Uncategorized and tagged Animals, Culture, Family, Marriage. Bookmark the permalink. Hair licking ~ now that’s a new one! One of our cats licks my hubby’s toes and I thought that was bad but it doesn’t compare to hair licking. Cats!! They certainly all are unique! I’ve got the perfect solution. Dan should spray his hair with the pet plaque spray right before Helen starts licking. Problem solved. Dan has to stop using tuna as a hair gel!